With the very sad news today of Jimmy's passing here's the concluding part of his last Radio 1Old Record Club broadcast on Sunday 27 September 1987. 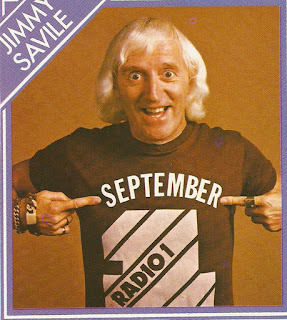 One final Jimmy Savile point is available if you know what his last record will be. Sir Jimmy Savile 1926-2011 How's about that then! …to put back your clocks one hour tonight. As summer time hours end in the UK and across Europe tonight how about a reminder of the days when the Radio Times used to produce what it rather cosily called its Fireside Issue. The BBC marks the top of the hour with the pips and still occasionally broadcasts the chimes of Big Ben, most notably at 6 p.m. and midnight on Radio 4. But I was reminded of the occasions when Big Ben was out of action when I received an email earlier this year asking me about Great Tom. Great Tom did indeed ring a bell! It was in 1977 that Big Ben was under repair and the BBC would broadcast the bell Great Tom at St Paul’s Cathedral. It just so happened to have been used on Radio 3 on Sunday mornings before the news summary and by chance I have a recording I made that year. 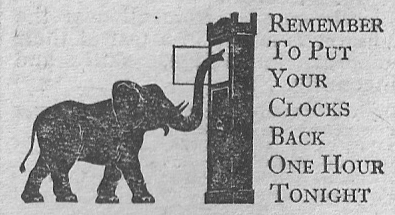 Great Tom had been broadcast regularly before back in 1956 when, I assume, Big Ben was out of commission. This is the fifteenth post in a series looking at the original nineteen ILR stations. This week Radio Victory. Radio Victory was the first of the original ILR stations to lose its licence, replaced from 28 June 1986 by Ocean Sound. 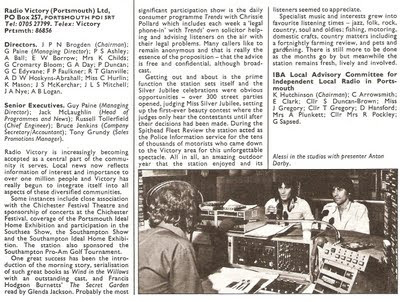 Its early history is interesting and for such a small station it was well supplied with ex-BBC staff due, in no small part, to its first Programme Controller being former Radio 1 DJ David Symonds. David declared that his programme policy was to meet with the DJs and discuss with them the timeslots they each felt best they could do. His stay at Victory was, however, short-lived. David’s early appointments included Dave Christian from Radio Luxembourg and Eugene Fraser as presenter and Assistant Head of Programmes from the BBC. Eugene had been a newsreader and presenter on Radio 2 (Night Ride, Brass and Strings etc.) and would return to the BBC as a newsreader on Radio 4. 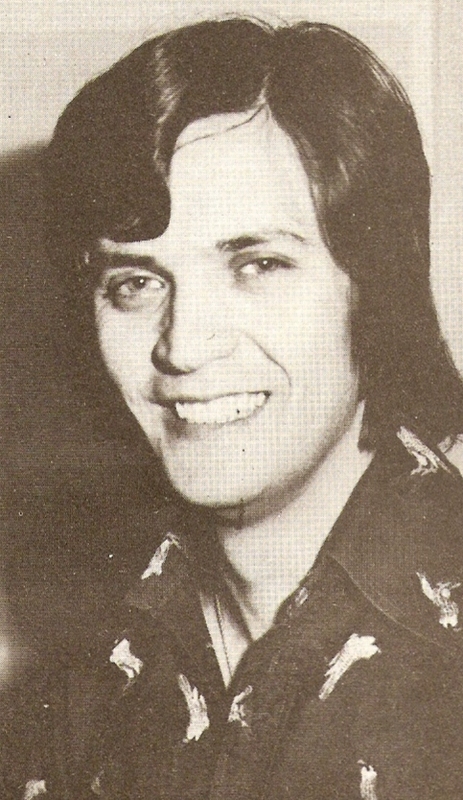 Former Light Programme and Radio 1 DJ Don Moss also joined in 1976 to present Don Moss’s Sunday Jaunt. During 1975 and 1976 Victory even had Kenny Everett as one of its presenters. Kenny provided pre-recorded shows for the station and inevitably created some bespoke jingles in his home studio. 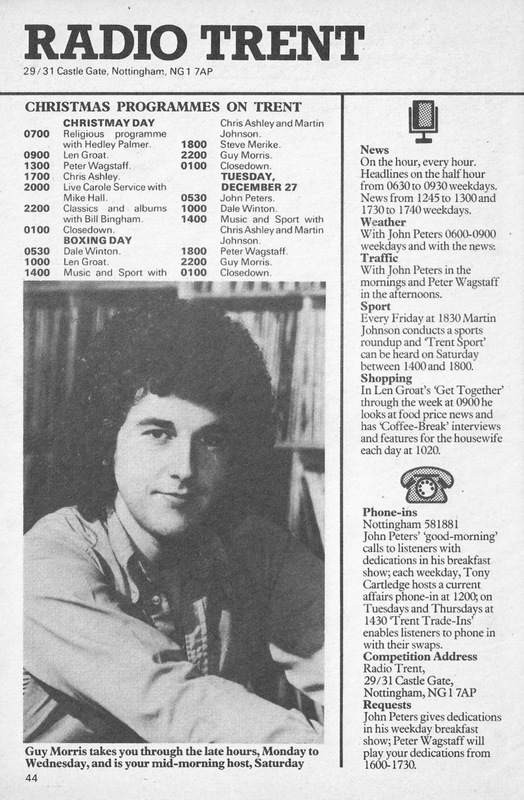 When Victory first went on air it was DJ Glenn Richards who made the opening announcement. Glenn would later make the occasional appearance on Radio 2 on the BBC Radio Orchestra shows and later, by now known as CJ, present on DevonAir. Read more about David Symond’s career in this post. What a packed and varied schedule Victory had with 40 different programmes across the week including jazz, folk, rock ‘n’ roll, classical, religion, motoring, quizzes, gardening, fishing and antiques. Folk & Us presenter was comedian and singer Shep Woolley. 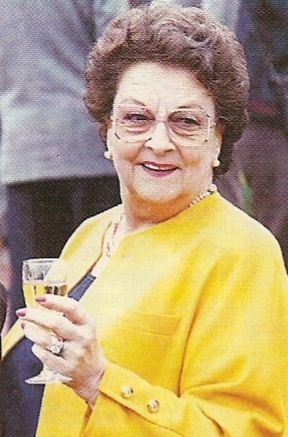 With a motoring programme was former Formula 3 champion and rally driver Jean Denton, later Baroness Denton of Wakefield. 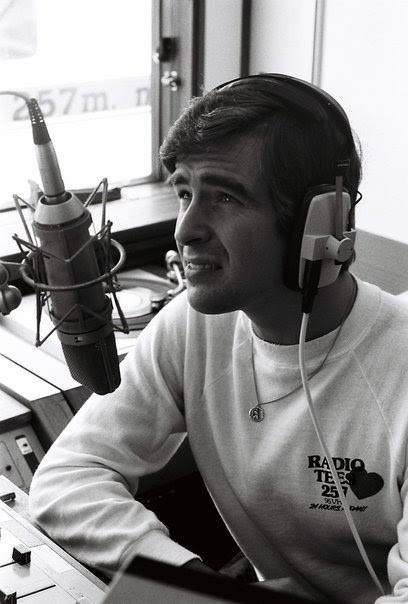 Breakfast Show presenter Howard Pearce would later go on to work at Radio 210, Luxembourg, Radio 2, Mercury, VH1, Sky Sports, Virgin, Jazz FM, Smooth and Silverstone Radio. With the mid-morning Trends (the name of a feature on Round the Horne if I recall) was Christine, better known as Chrissie, Pollard. Starting as a reporter on the Western Daily Press and Bristol Evening Post she got her taste for broadcasting as a reporter for the BBC in Birmingham. There followed stints for the BFBS in Cologne and then Malta, co-presenting The Five O’Clock Run with David Burrows. 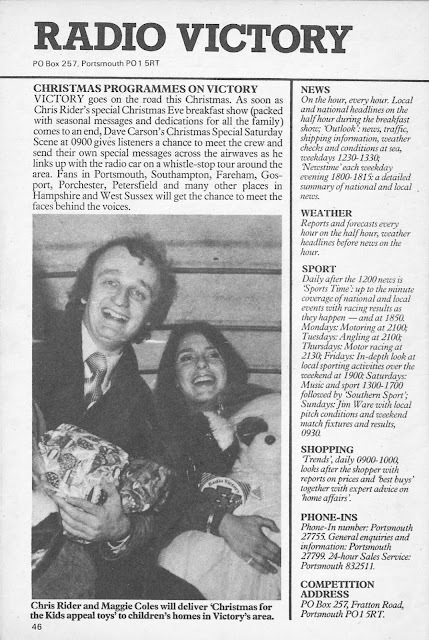 Back in the UK Chrissie was at Victory and then at TVS in Southampton as one of the co-anchors of Coast to Coast. Due to family connection with South Africa she spent time training would-be broadcasters at CCFM, a Christian radio station in Cape Town. Still broadcasting Chrissie was on Hope FM in Bournemouth and can be heard on Offshore Music Radio and occasionally on BBC Radio Solent. Jack McLaughlin (aka Yak MacFisheries, aka The Laird of Cowcaddens) had been a pirate DJ on Radio Scotland, Britain Radio, Radio 390 and Radio 270 (under the name Steve Taylor).He went legit and was with the original team at Radio Clyde and also worked as an announcer/presenter on Grampian Television and STV (Pop Scotch, Thingummyjig and Junior Try for Ten) and on BBC Radio 2 (Folk 74 and Folk 75). Whilst at Capital he was poached by David Symonds to join Radio Victory where by 1977 he was Head of Programmes and News. Later Jack would establish Radio Scotland Worldwide Ltd, an internet broadcast company, though as far as I can ascertain this company has been dissolved. 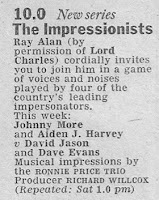 Anton Darby, known as ‘Dapper Darby’, hosted Darby Day (oh, those punning ILR programme titles again). Anton had trained as an actor and had appeared in such TV programmes as The Wednesday Play and Softly Softly. After his spell on radio he continued to work in TV both as an actor and behind the scenes – I spotted his name as ASM when recently watching some old episodes of The Darling Buds of May. Dave Christian (real name David Crockford) returned to the Grand Duchy, again working for RTL but this time broadcasting on the French and German services. Dave died in 2010. 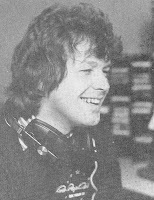 Tea Time Treat host Andy Ferris was another ex-BBC member of the team, he’d been on Radio 1 alongside David Symonds and others as one of the presenters of Sounds of the Seventies as well as being on the review programme What’s New. Does anyone know what subsequently became of Andy? Nicky Jackson, as he was then known, was taken on as a trainee DJ having worked in the discos of Portsmouth. Later as Nick Jackson he joined Radio 2 as an announcer/newsreader and presenter (Star Sound and You and the Night and the Music). You’ll also hear his voice on old episodes of Celebrity Squares and Catchphrase. Presenter of The Wonderful Wobbly Wireless Show was Sarah Ward who was well known to Capital Radio listeners and to those of the BBC World Service. Sarah had cut her broadcasting teeth on the BFBS in Nairobi before joining The Voice of Kenya and then as a BBC announcer and presenter of Junior Points of View. These days Sarah can be heard on Jazz FM with the daily Dinner Jazz. Dave Carson would go to host Victory’s Breakfast Show and then run entertainment agency Accolade Productions in Southampton. Daughter Lucy is a singer and son Jon runs an entertainment business. With Fish on Sunday (surely you have fish on a Friday?) was Tony Fish. Tony left school to work as a TV repair man before joining the BBC in 1970 as a technical operator. Four years later he was at Radio 1working in production before joining BBC Radio London doing their traffic reports. In April 1975 he presented the Breakfast Show at that station and then later that year Home Run. At the same time he was on Victory with his Sunday morning show. 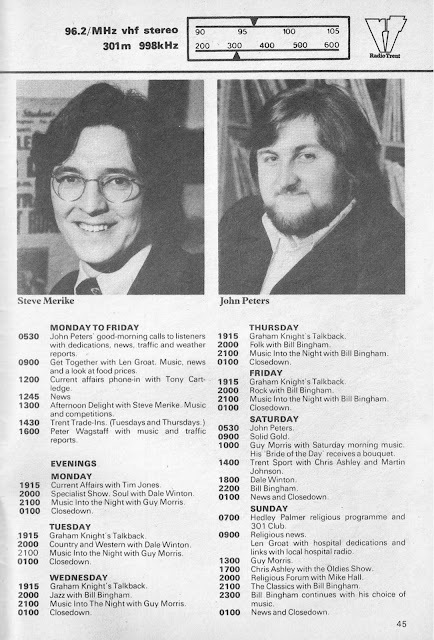 Tony became a tutor at the BBC Radio Training Unit before moving into BBC local radio management, first at BBC Radio York, then Newcastle and Shropshire. He retired in 2002 and died suddenly in 2005. Presenting a couple of shows on Saturday evening was Keith Butler. Keith would go on to be a very popular DJ at Radio 210 followed by Capital Gold, Easy Radio and finally Time 106.6. He died unexpectedly in 2008. DJ audio courtesy of Ingemar Lindqvist and Paul Stenning. This isn’t a post about the current single by Marina and the Diamonds but Radio Active, Britain’s only national local radio station that was the Radio 4 hit comedy show between 1980 and 1987. 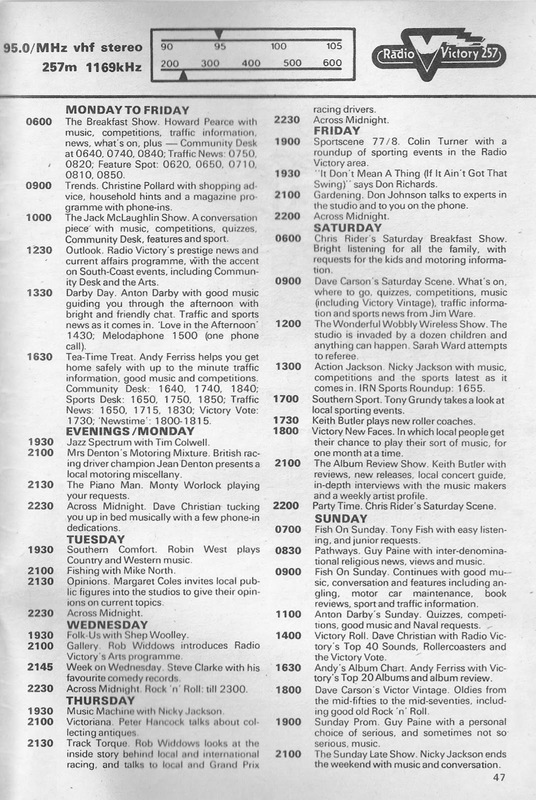 This is the programme that introduced us to Mike Channel, Mike Flex, Anna Daptor, Martin Fry, Nigel Pry, The Hee Bee Gee Bees, Sir Norman Tonsil and the rest. 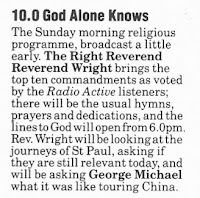 Back in 1987 the third programme in series 3 (God Alone Knows) was broadcast as usual on the Saturday but due to many complaints the Wednesday repeat, and all subsequent repeats, went out in an edited form. Yet again mocking religion got the broadcasters into trouble. “…in the broadcast church service near the start of the episode the inability of any of the congregation to recite the Lord’s prayer correctly was replaced with a request for two girls in the front row to turn off their Sony Walkmans. The new translation of the Bible was also heavily edited, the new 10 commandments were changed to remove two which were originally of a sexual nature (replaced by "thou shalt not listen to the Beastie Boys” and "thou shalt not support Arsenal"). A description of the cover was deleted completely. To make up the lost time the preceding article was lengthened with a few extra lines”. This is the fourteenth post in a series looking at the original nineteen ILR stations. This week Pennine Radio. Still on air? : No, rebranded as The Pulse in 1991. 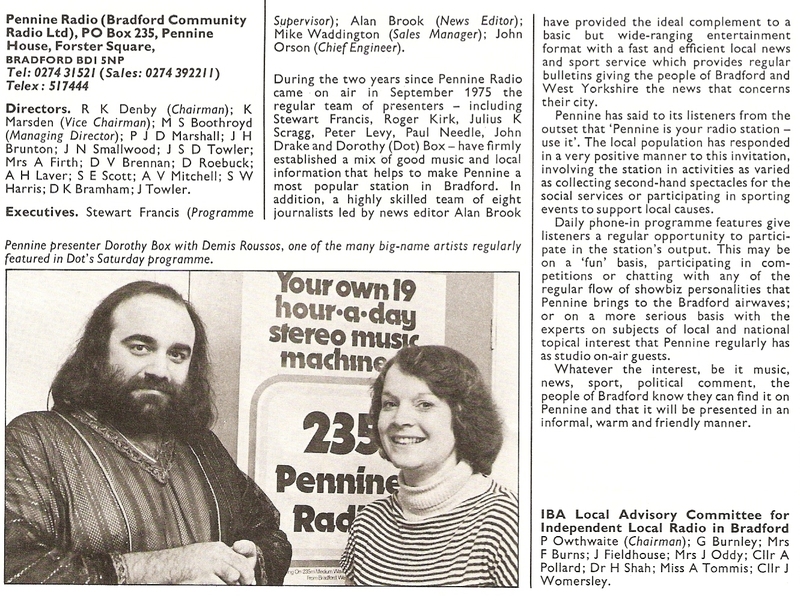 There’s a bit of friendly rivalry between the cities of Leeds and Bradford but it was the latter that got the first ILR station when Pennine went on air in 1975, probably because the BBC already had studios in Leeds. Radio Aire did launch in 1981. Viewers of Look North from Hull will recognise the photo bottom right of a young Peter Levy. Peter is still broadcasting on the radio every day in almost the same time slot as 34 years ago between noon and 2 p.m. on Radio Humberside. In fact Peter Levy started his career as an actor appearing in programmes such as Dixon of Dock Green, Comedy Playhouse and The Mike Yarwood Show. Pennine was his first radio job but he has been on air in the North ever since, presenting City Extra at Liverpool’s Radio City and then moving to Radio Aire and BBC Radio Leeds. Whilst at Leeds he started doing the odd bulletin for Look North, eventually becoming a full-time presenter. Presenting Pennine’s Breakfast Show Early with Hurley was Mike Hurley. Mike joined the station form a Leeds advertising agency. But he became best known for his show Hurley Burley, first on Radio Aire and then for many years on BBC Radio Humberside. His most famous invention was Bill Bore, “the archetypal, flat capped, opinionated Yorkshireman.” Mike went on to win a Sony Award for his show and combined his broadcasting with advertising voiceover work. He died in 2008. Stewart Francis was a club DJ who took a turn on pirate radio and at Radio 1 before moving to LBC to host Nightline. He recalls how, whilst covering the University Boat Race for IRN, his boat was rammed by a BBC TV launch and Stewart dropped his microphone into the Thames. He was a presenter and programme supervisor at Pennine and later was managing director at KL.FM 96.7 in Kings Lynn. Roger Kirk had been a technical operator at Radio 1 and did get one of the many try-out slots they had in the early 70s but didn’t get a regular programme. Moving to Radio Nordsee International he managed just one show before sea sickness forced him to work back on the mainland over in Holland. He joined Capital Radio as an engineer when it started in 1973 before moving up to Bradford. Later he was on Hallam, Viking, Classic Gold, Stray FM and Magic 828. Roger died in 2001. 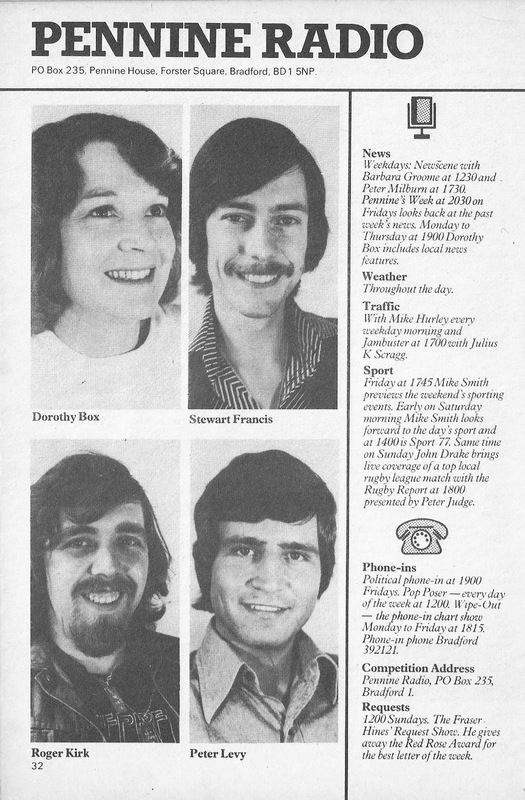 Further information about four Pennine broadcasters has so far eluded me. I can find out nothing about Julius K Scragg other than his real name was Jack Maher and nothing too about Dorothy Box, Paul Needle and John Drake. If you know anything about these presenters please contact me. 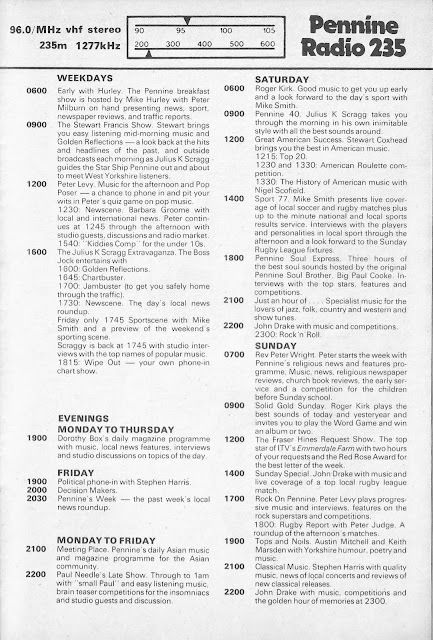 The Fraser Hines Request Show was a Sunday lunchtime fixture. Fraser had been playing Joe Sugden on YTV’s Emmerdale Farm since ’72 and was well-known prior to that as Doctor Who’s sidekick Jamie. Sunday evenings brought Tops and Noils with Austin Mitchell and Keith Marsden, a programme of “Yorkshire humour, poetry and music”. Austin was well known to Yorkshire folk as one of the presenters on the ITV regional news magazine Calendar and from 1977 he became the MP for Great Grimsby. Incidentally ‘tops’ and ‘noils’ are terms used in the spinning industry, so important to Bradford’s industrial growth. I was watching yet another energetic performance by Lee Evans on The Jonathan Ross Show the other week, Lee was recalling the days when his comedian dad Dave used to tour the clubs. That TV appearance reminded that Dave also did impressions and was a regular guest on the Radio 2 show The Impressionists. 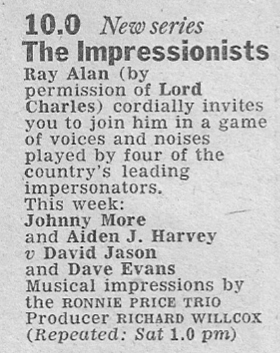 In this edition from 1981 the chairman is Ray Alan (of Lord Charles fame), who had replaced the original chair Barry Took. Doing the impressions alongside Dave Evans are Aiden J. Harvey and Johnny More, who you may remember from the 1970s ITV series Who Do You Do? Fourth on the panel was David Jason. That year David was on the cusp of TV stardom as Del Boy, although he’d already done plenty of telly (Open All Hours and Porridge) and was still a regular on radio with his series The Jason Explanation and had been providing comedy voices and impressions on Radio 4’s Week Ending since 1970. This programme was first broadcast on Thursday 4 June 1981. 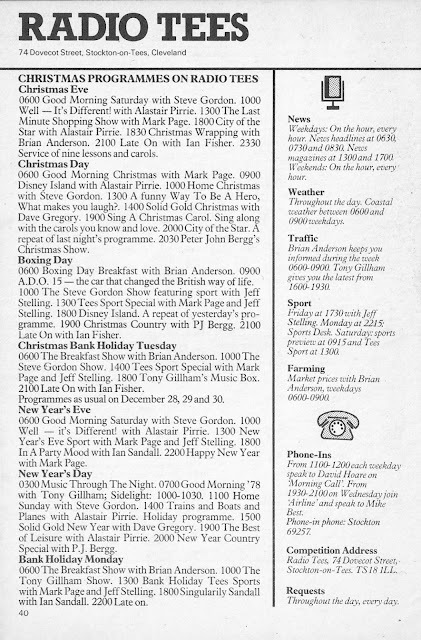 Funny You Should Ask was the Radio 2 entertainment quiz that ran from the mid 1970s to the mid 80s. Under the somewhat shambolic chairmanship of Peter Jones the quiz was essentially a chance for entertainers to provide a few amusing anecdotes about their career; a good story mattered more than the score. In this programme, first broadcast on 28 June 1982, you’ll hear from Betty Driver, Ken Dodd and Ken Platt. I’m posting this programme by way of tribute to Betty who died earlier today. Although mainly associated with Coronation Street Betty had a long career as a singer and appeared on stage, in film and on the radio. Her radio series A Date with Betty was scripted by a young Bob Monkhouse. This is the thirteenth post in a series looking at the original nineteen ILR stations. This week Radio Trent. Still on air? : No - now part of the Capital FM Network from January 2011 but has been recently resurrected, see post below. 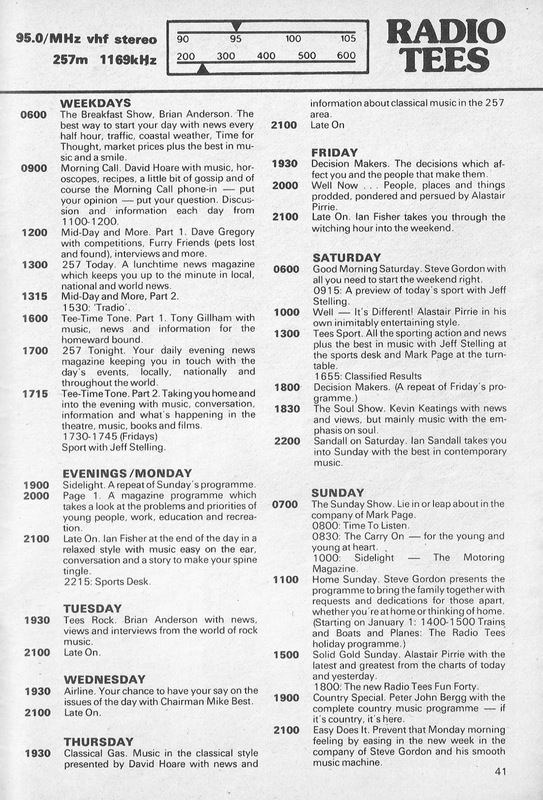 When Trent launched the then Programme Director Bob Snyder promised “programming” and not “programmes” where the DJs would “not say a lot”. The daytime music policy was mainstream pop and the target listener was a “28 year old housewife in West Bridgeford who is doing the hovering.” The reason Trent played so many oldies was “that such a housewife was brought up on pop and that the oldies will remind her of when she was courting.” In the evening the station was more contemporary and progressive with the intention of aiming at a large student audience – Trent covered the universities at Nottingham, Loughborough and Leicester. Perhaps best known of the first team was David ‘Kid’ Jensen who’d come from Radio Luxembourg, as far as I’m aware the first 208 DJ to join ILR straight from that station. The Kid was on Trent for just over a year as by the Autumn of 1976 he’d moved on to Radio 1 with a Saturday morning show. David is now on Smooth Radio with a whole host of former Radio 1 DJs. Presenting specialist music shows and on at the weekend was one Dale Winton. Like many other early ILR DJs Dale got his break into radio at the United Biscuit Network (UBN), initially broadcasting under the name Simon York, before joining Trent. He moved on to Blue Danube Radio in Vienna, Chiltern Radio and Beacon Radio, where he’d been offered a job by former Trent man Pete Wagstaff. By the late 80s Dale was on TV and, of course, he is known for Supermarket Sweep and various lottery shows. Dale returned to the radio when he took over Pick of the Pops from Alan Freemen in 2000 and continued to present it until last year. 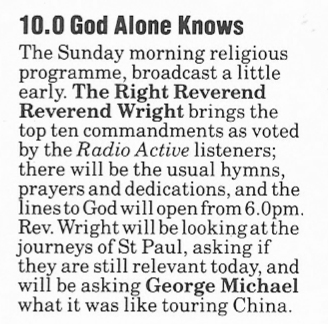 Occasionally he has sat in for a holidaying Steve Wright too. Steve Merike (real name Michael John Willis) had been a pirate DJ in the 60s, briefly on Radio Scotland and then Radio Caroline South. He joined Radio 1 in 1970 presenting a number of shows including a spell deputising for Tony Blackburn on the Breakfast Show. But his time there was short-lived and he left after a fall out, just in time to be invited to restart pirate station Radio Nordsee International. He moved on to BBC Radio Brighton and LBC before heading north to Manchester where he was Head of Music at Piccadilly Radio. By ‘75 Steve was Deputy Programme Controller at Pennine before his move to Trent. Later he would broadcast on Forth Radio, Radio Victory, Radio Leeds, GEM-AM, Oak FM, Saga 106.6 and in Australia. No longer broadcasting, his radio experience is now put to use as a lecturer in media and education at New College, Nottingham. Last year he stood as the Liberal Democrat candidate in the General Election for the Loughborough constituency. John Peters had worked as a Post Office telecoms engineer but acquired an interest in music and radio after building a DJ console at a local youth club. Failing to get jobs with Radio 1 and Luxy he was approached to join the team at UBN in 1974. The following year he joined Radio Trent to host their Breakfast Show. 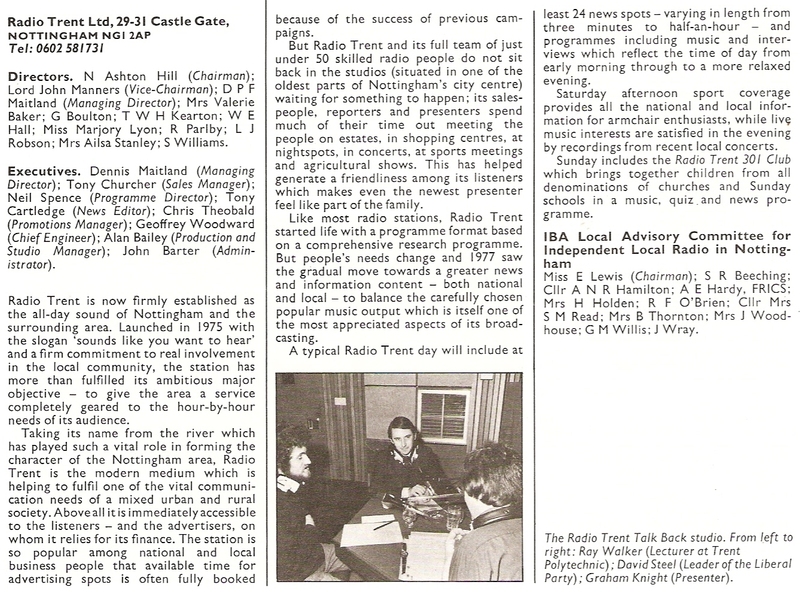 Later John presented on GEM-AM (Trent’s medium wave service), Saga and Smooth as well as community stations Lincoln City Radio and Gravity FM in Grantham. Currently you can hear John on Radio 2XS and the new Radio Trent – both stations run by his former Trent colleague Jeff Cooper. 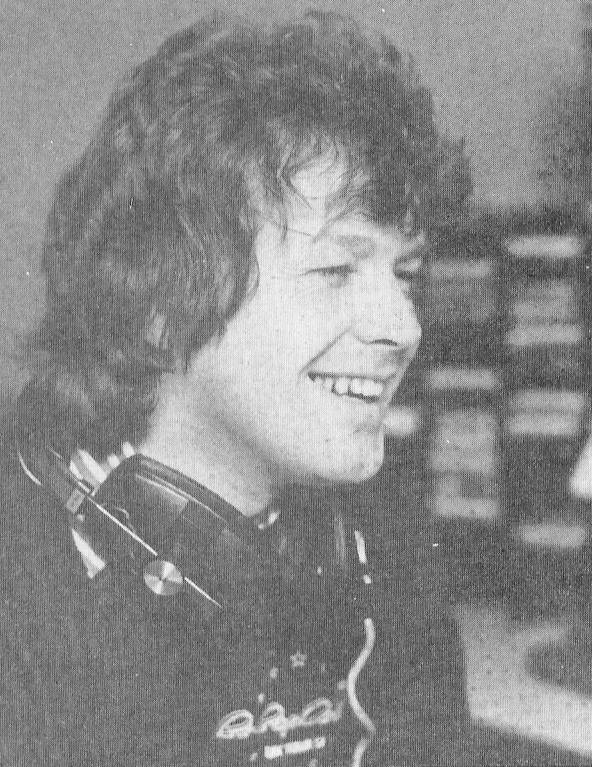 When Guy Morris joined Trent in 1975 he was completely new to radio. Four years at the station he moved on to BRMB and Radio Victory before joining the launch team at Leicester Sound. Guy became Programme Director at Silk FM before moving back to Portsmouth on Ocean FM and setting up MLS Audio, a PA equipment hire company (one of his first jobs had been as an installer of sound and light equipment). Earlier this year Guy returned to broadcasting as part of the new Trent service. 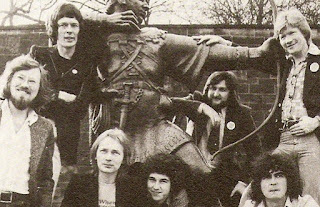 Talkback host Graham Knight cut his broadcasting teeth on hospital radio in Birmingham before getting a job with BRMB and in the following year starting at Radio Trent, where he would stay for eight years. 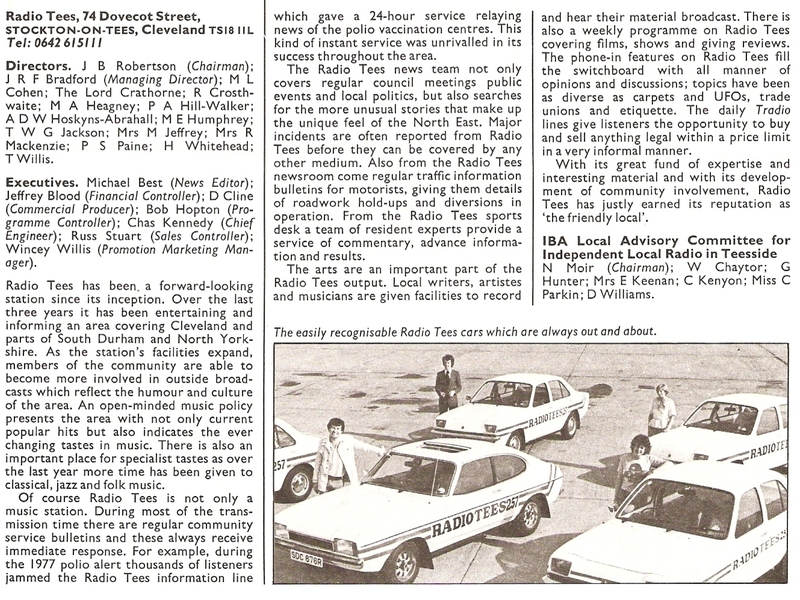 Thereafter Graham moved to BBC Radio Derby and also did stints on Radio 2’s weekend Early Show. Retiring to run and tea and coffee shop in Sherwood he died in 2009. Pete Wagstaff left Trent in 1979 and went ‘down under’ to work at 2KA in Sydney. Returning to the UK first to Chiltern Radio and then in 1985 at Beacon Radio where he hosted the breakfast show, went on to become Programme Director and launched the AM service WABC as well as Beacon Shropshire. Pete was then at Century, The Wolf and Telford FM and now looks after the radio interests of Midland News Association Ltd (107.2 The Wyre and The Severn). Len Groat had been at ILR stations Metro Radio and Piccadilly before moving down to Nottingham, bringing some of his PAMS produced jingles with him. He presented Groat Market and The Len Groat Get-Together and would later become Programme Director at the station. At Trent until 1994 Len worked for GEM-AM, Saga and Smooth. Now retired and living in Portugal he’s a regular contributor to Jinglemad and earlier this year started the Seventies Sunday show on Trent Sound. If you’ve been listening to the Radio 2 series Sounds of the 20th Century you’ll recognise the voice of Bill Bingham reading the news headlines. That series has taken much of its material from the earlier Radio1 series 25 Years of Rock broadcast at a time when Bill was a newsreader on the network .He moved on to work at Radio4, LBC, Jazz FM, BFBS 2, Saga, Liver FM and Smooth. Currently Bill can be heard on Sky News bulletins and on at the weekends on one of the ‘new’ Trent stations. As well as his radio presentation work Bill is an actor on stage, TV and radio. Presenting a daily current affairs phone-in was news editor Tony Cartledge. Tony had been a news reporter for the Hull Daily Mail before joining the news team at BBC Radio Humberside. He moved to Metro Radio when that launched in 1974, then on to Pennine Radio and Radio Trent. Tony returned to the north east to again work for Metro before setting up an independent television production company whose commissions included The Sunday Interview for Tyne-Tees. With his wife he now jointly owns and runs Picasso’s Restaurant in Whitely Bay. 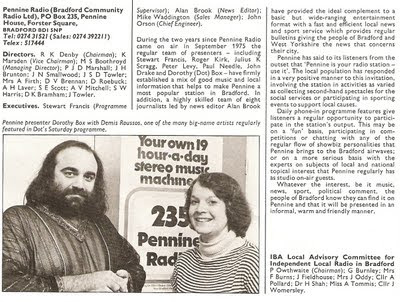 Trent’s Programme Director at the time was the Neil Spence, better known in his pirate radio days on Big L as Dave Dennis, the ‘Double D’. Back on land he became Programme Director at UBN and so was John Peters boss at both stations. He died in 2007. 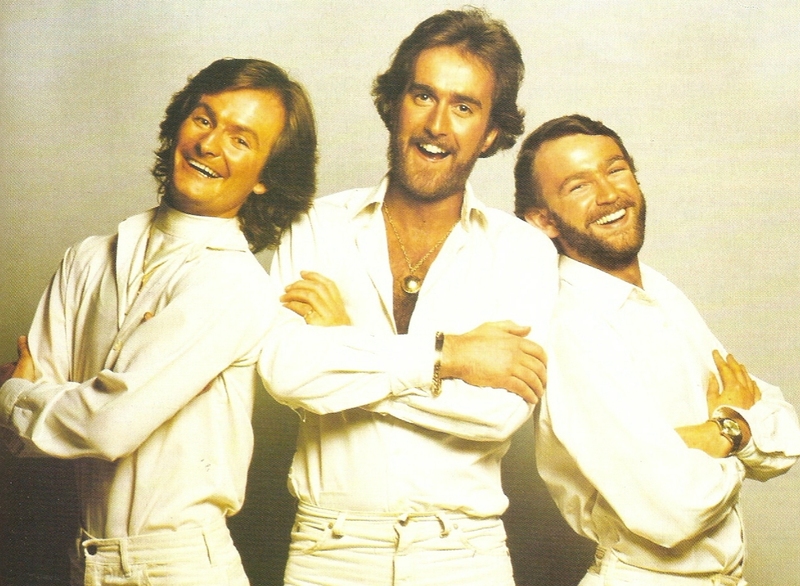 In late 1979 Radio Trent produced what was supposedly ILR’s first situation comedy: starring Bill Maynard and called Cobblers it was about a four lads that work in a show factory – hence the name – and decide to form a pop group. The group is managed by Bill’s character Vernon Wilkinson. Trent producer Martin Campbell had high hopes of the series going to TV. As far as I can ascertain it didn’t. Perhaps Cobblers was an appropriate title in more ways than one! Trent was swallowed up as part of the Capital Network in January of this year when a number of the old ILR names disappeared. However this summer, phoenix like, Radio Trent came back, twice over! First off the blocks on 13 June was Trent Sound. Programme Controller Jevan Lloyd promised to “deliver a real live local radio for the City of Nottingham.” To help recreate the sound old Trent jingles were re-written and recorded by S2Blue. Len Groat, who was instrumental in commissioning the jingles first time round, has joined to present an oldies show and ex-Trent DJs Andy Marriott and Craig Strong are also back. On 2 July an online Trent started broadcasting. Put together by Jeff Cooper, and using his facilities at 2XS, this version has more of the big names from the past: John Peters, Guy Morris, Bill Bingham, Tim Disney, Tim Rogers and Jeff himself. “You get right up my nose you do pal.” In a week when the BBC announces cutbacks in the amount of comedy on Radio 2 I recall one of the most popular comedy shows of the 1980s. Robin Colvill, Maurice Lee, Graham Walker. Albert Sutcliffe and Carl Sutcliffe performed as The Grumbleweeds in radio series between 1979 and 1989. So here are memories of Uncle Nasty. 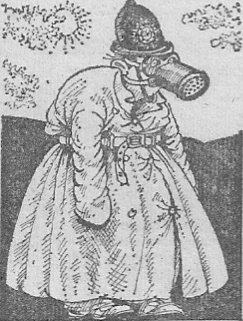 Wilf ‘Gas Mask’ Grimshaw and Tiny Tots Teatime Time. This is the twelfth post in a series looking at the original nineteen ILR stations. This week Radio Tees. I have a particular soft spot for Radio Tees as it was the only ILR station that I could regularly listen to in the late 70s. 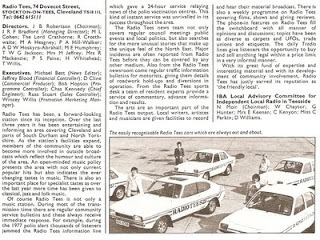 Although living in East Yorkshire at the time the signal was sufficiently strong enough for me to listen to Tees, though it did fade in and out depending on the weather conditions. 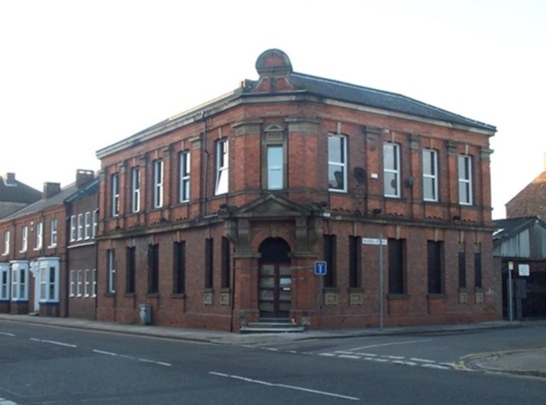 Opening in 1975 the studios were based in the old water board offices in Dovecot Street, Stockton – looking very similar to the old dock offices that I worked in for the council in Goole. 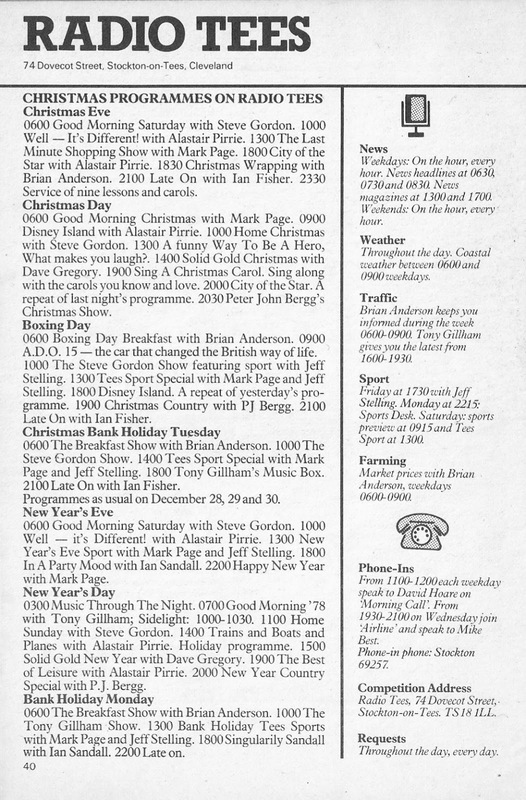 And this is how Tees sounded on day one with the Les Ross Breakfast Show complete with market prices, back then it was the meat market rather than the FTSE. The presenter I remember the most is Dave Gregory who was, it turned out, the most experienced of that Tees team. After a short stint on the pirate Radio Nordsee International he worked for the United Biscuits Network (UBN). This led to an opening at Radio 1 producing on-air promotional material and occasional shows including a Saturday afternoon programme and once standing in for Tony Blackburn on the Breakfast Show. Also at BBC Radio London and on the BFBS he joined Metro Radio in Newcastle when that started in 1974 before hopping across to Stockton the following year. Dave was subsequently at Pennine Radio, Essex Radio, Radio Luxembourg, Invicta Gold, Chiltern Supergold, Choice FM, Jazz FM and LBC. These days he concentrates on advertising voiceovers and occasional stints on Solar Radio. On The Breakfast Show at this time was Brian Anderson, having taken over from Les Ross who’d gone back to the Midlands to join BRMB. Brian had briefly been as Radio Caroline before joining Tees where he would become Head of Music. In 1981 he moved to Scotland where he has been ever since, firstly as presenter and Head of Programmes on Moray Firth Radio and then running Window Communications Ltd making programmes for China, Vietnam and Mongolia. He now runs a video production company. On Morning Call was David Hoare. David had gained his on-air experience when aged just 15 with the Gibraltar Broadcasting Corporation before coming to the UK and working at BBC Radio Birmingham hosting their early morning show On the Move. He joined Radio Tees when it started and on leaving went back to the GBC and was also ordained as a minister of the Church of England. The Reverend David Hoare makes occasional broadcasts on Radio Gibraltar. Tea-Time Tone was none other than Tony Gillham (left), another UBN recruit. Prior to that Tony had DJ’d on the continent and freelanced as a BBC announcer. Thereafter, like Dave Gregory, he was something of a radio nomad: Orwell, Mercia Sound, Chiltern, Radio 2 (on the weekend Early Show), Radio Broadland, BBC Radio Bedfordshire, Brunel Radio in Swindon, Programme Controller for the Classic Gold Network, BBC Radios Oxford, Northampton, Devon and Jersey. Tony is still on air each Saturday with Gillham Gold on BBC Radio Cambridgeshire as well as running a community station in St Neots, Black Cat Radio. In charge of the newsroom and hosting the weekly phone-in Airline was Mike Best, who'd succeeded Bill Hamilton as News Editor. Mike had started as a reporter on the Newcastle Journal before moving into local radio at Radio Durham, Leeds and Carlisle plus an attachment to the Today programme. He was at Tees for four years before helping to set up the news operation at Radio Aire. At Yorkshire Television from 1982 he worked his way up from News Editor to Director of Broadcasting. Mike now runs his own media company BestMedia and lectures in Broadcast Journalism in York and Leeds. Other members of the news team I recall from this time are Kent Barker, Diana Goodman and Lee Peck. After working for BBC radio and TV news and for ITN, Kent now runs his own production company. Diana became the BBC’s first female foreign correspondent with postings in Bonn, Berlin and Moscow. Lee went to work for Radio Trent and was then one of the co-presenters of the TV show Game for a Laugh. After that I’m not sure what happened to him. Alastair Pirrie was at Tees for a while and is mainly remembered for Pirrie PM but his ambitions lay in television. He had worked at BBC Radio Cleveland and on Radio 2 devised and presented Gospel Road a Sunday morning broadcast in 1974. On BBC TV he presented Parents and Children and See You Sunday. For the local Tyne Tees station he was on Saturday Shake-Up, a children’s Saturday morning show with Christine Anderson; Razzamataz, where one of the young co-hosts was Lisa Stansfield; Lynn’s Look-In and moving into directing/production on the short-lived pop show The Roxy. You may also remember the early 80s BMX Beat for Border TV which Alastair co-presented. He went on to pursue a career in TV directing, working for a time at Chrysalis TV. Also now in television is Late On host Ian Fisher. Leaving Tees he moved across to Carlisle to work at Border TV as a continuity announcer and then producer and director mainly of science documentaries. He was in the news in 2009 when his company Creative Imagineers Ltd was reported to have bought the name ‘Border Television’ following the merger of that station with Tyne Tees. At the weekend on Tees you could hear Steve Gordon, who sadly died in a helicopter crash in Ireland, and ‘Me Mark Page’ as he became known. Mark (real name Mark Gibbon) was something of an early starter: on hospital radio at 14, a junior assistant at Radio Cleveland at 15 before joining Tees aged just 16. He went on to host the Breakfast Show before joining BBC Radio 1where he was on the daily early show and various weekend slots. Moving on to Luxy, back to Cleveland then, in no particular order BBC Radio Newcastle, Magic 1170, The Pulse, Aire FM, Clyde 1, Real Radio, BFBS, Scot FM and Perth FM. But Mark’s main interest is in Garrison FM, a company he established in 2001 that broadcasts to the British Army bases in the UK. Mark broadcasts on the station every Saturday lunchtime. I musn’t forget the main sports presenter back in 1977 Jeff Stelling. Jeff is now a very familiar face on TV on Sky’s Soccer Saturday and as the host of Countdown, at least until the end of this year. Radio Tees hadn’t yet gone 24 hour so we still had a good old-fashioned closedown at midnight and station start-up at 6 a.m. Here’s part of the start-up probably recorded in 1978. I’d always assumed the theme was specially written for the station and it was only years later I discovered that it’s the track Forecast by Eric Gale. Note the name of one Wincey Willis as Promotion Marketing Manager. Wincey, of course, went on to enjoy a television career on TV-AM and Channel 4’s Treasure Hunt. She currently broadcasts on BBC Hereford and Worcester every Saturday morning. There was a time when most evenings you’d hear a comedy show or quiz on Radio 2 produced by the Radio Light Entertainment department. Nowadays the network considers itself to be much more of a music station and such programming has virtually disappeared. It seems that Radio 4 Extra, and its predecessor Radio 7, rarely revisit these Radio 2 shows so I thought I’d fill the gap. So in this post I’m recalling one of the network's panel games from the 1980s - Dealing with Daniels. Running from 1982 to 1989 it was yet another creation from the mind of Ian Messiter, he of Just a Minute fame. Hosted by magician Paul Daniels (“you’ll like this…not a lot”) the idea was for the panellist to answer not-too-serious questions from a pack of question cards based on playing cards. So each suite was a different category and each card worth a different number of points, court cards and aces being worth more. If a player asked for a card that had already been drawn they’d get the horn from Mr Daniels. 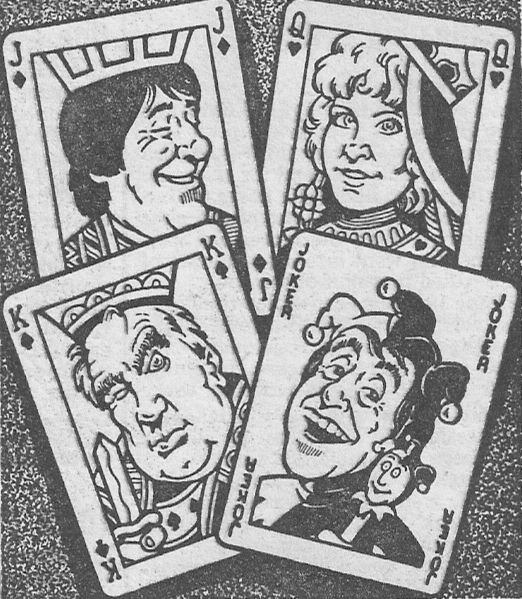 Playing a joker could wipe out any minus points and guessing when all the cards had been used gained you 10 points. Clear? The first series started on 28 December 1982 with a panel of Barry Cryer, Lorraine Chase and Mathew Kelly, but the series regulars became Patrick Moore and Duggie Brown. 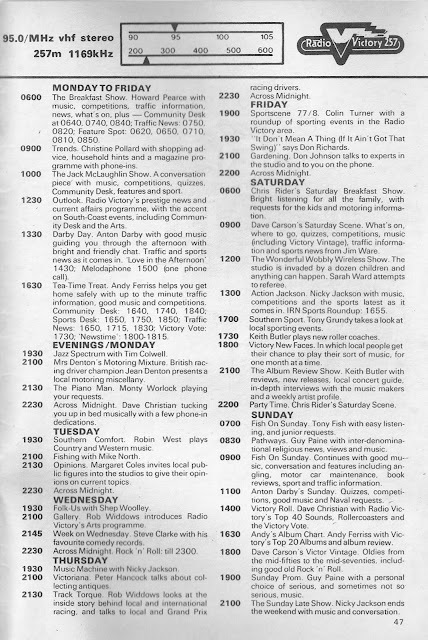 Here’s the first programme of the second series which features Michelle Dotrice alongside Patrick and Duggie. 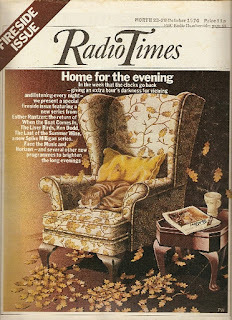 This programme was broadcast at 10 p.m. on Tuesday 29 May 1984.